When troubleshooting a vehicle with a diagnostic system, the only difference from the usual troubleshooting procedure is connecting the Techstream to the vehicle and reading various data output from the vehicle steering lock ECU (steering lock actuator assembly). The steering lock ECU (steering lock actuator assembly) records DTCs when the computer detects a malfunction in the computer itself or in its circuits. To check the DTCs, connect the Techstream to the DLC3 on the vehicle. The Techstream enables the DTCs to be cleared, the indicators to be activated, and the Data List to be checked. 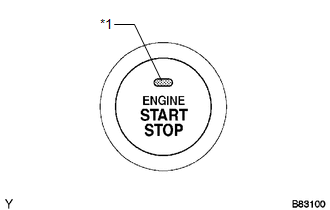 (b) The diagnosis information of the steering lock ECU (steering lock actuator assembly) is transmitted to the Techstream via the certification ECU (smart key ECU assembly) as the steering lock ECU (steering lock actuator assembly) is not connected to CAN. (1) Check the DLC3 (See page ). The motor operates to release the steering lock, but the steering lock cannot be released (e.g. the lock bar is stuck in the steering column). Push the engine switch while turning the steering wheel left or right. There is a short in the devices activating the motor. There is a problem in the steering lock ECU (steering lock actuator assembly) or power management control ECU. Troubleshoot by following "How to Proceed with Troubleshooting" (See page ).